Mahonias are evergreen shrubs with leathery and often spiny, dark green leaves. In the autumn and winter they produce long-stalked clusters of slightly scented yellow flowers that are followed by dark purplish berries. The plant’s common name is Oregon grape, reflecting the passing similarity of the berries to bunches of black grapes and its adoption as the state flower of Oregon in 1899. Mahonias have great qualities for the garden, particularly in difficult shaded locations, and they provide variety and interest in the winter when many other shrubs are bare or dormant. The more common varieties grow to a height of 4m and spread to approximately 3m, but there are smaller types available, including a few that can be used as an open woodland ground cover. While only a few are commonly grown as garden shrubs, there are approximately 70 species in the plant’s natural range of Central America, North America and Asia, mostly growing in woodlands or woodland edge conditions. This article provides information on the requirements of Mahonias and gives tips on caring for them in the garden. Generally, garden centres and local nurseries sell only a few types of Mahonia, so for other varieties it is necessary to go onto the specialist nurseries’ websites or to pay them a visit. The most common types are listed below. Mahonia aquifolium is a species that is commonly grown in smaller gardens or patio beds as it is much more compact than many of its relatives at up to 1.5m tall, while still being upright and bushy if grown in its favoured semi-shaded conditions. Its leaves are a dark green that is often tinged with red, and it bears dense clusters of yellow flowers throughout the winter. Mahonia japonica, as it name suggests, is one of the Asian species. It is slow-growing, and seldom grows taller than 1.5m high, but it has a good, bushy form and can spread to 2.5m wide. The leaves are leathery in appearance, strongly spined, and it produces drooping clusters of scented pale yellow flowers from late autumn into early spring. It has been given the Royal Horticultural Society’s Award of Garden Merit. Mahonia x media ‘Charity’ grows up to 4.5m tall in ideal conditions, and has an upright and bushy form. It bears typical yellow flowers from November through to February, and has very glossy, dark leaves. It is fully hardy in the UK. Mahonia x media ‘Wintersun’ is not quite so tall at 3m, but has equally glossy leaves and fragrant yellow blooms that it will produce in succession from November through to March. While it does best in semi-shaded conditions, it will cope better than most Mahonias with some sunshine. It is an RHS Award of Garden Merit winner. If the shrub’s fragrance is an important factor in your choice of Mahonia, then this is the one to go for. Mahonia eurybracteata ‘Soft Caress’ is the first commercially available spineless Mahonia. It is a small variety, growing to just 1m tall, and with a similar spread. It was ‘plant of the year’ at the RHS Chelsea Flower Show in 2013, and is becoming more widely available. Mahonia nitens ‘Cabaret’ is difficult to find but worth tracking down for its unusual orange-red flower bud spikes in August and September, that later open to a more typical yellow. It is another very compact variety growing up to 1m tall. It is less hardy that other types and is not suitable for the most exposed locations, especially in the north of the UK. Mahonia plants are typically brought home from the garden centre at around 50cm tall in 5 litre pots. Before planting them into the garden, plunge the pot into a bucket of water for half an hour while you prepare the planting hole. To give the shrub’s roots a good start, add a sprinkling of blood, fish and bone or bone meal to the base of hole, and mix some into the soil that you will be back-filling with. Keep them well watered until established. Mahonia’s have a reputation for dealing well with neglect, and certainly once established they generally look after themselves quite adequately. They are fully hardy, have very modest nutrient requirements and unless they are in crowded conditions, they grow and maintain their form with very little pruning. If it has been necessary to do some hard pruning to restore some order, then they benefit from a little more care over the following winter, such as a good mulch of garden compost, well-rotted manure or another similar organic material to prevent frost getting to the roots. Most prefer full shade or partial shade, though a few types will tolerate some sunshine. Established Mahonias require watering infrequently but well in very dry periods only. Do not allow the ground around them to become waterlogged. They thrive in a variety of soil types including loams, clay, chalky soils and even sand. They show little preference across the typical garden soil pH range, growing well in acid, alkaline or neutral conditions. For best results, provide an annual mulch with garden compost or well rotted manure in September to protect from frosts and to control weeds. In addition, feed the shrub with a light sprinkling of blood, fish and bone or a slow-release, balanced nitrogen, phosphate and potash fertiliser around its base in March or April. Mahonia does not grow well in pots or containers, and should be planted out into the garden border into its final position when bought. Pruning will not often be necessary. Occasional trimming to shape at any time of year or even a harder prune following flowering in April or in the early autumn will do no lasting harm to a Mahonia provided it is well established and you look after it well for a few months afterwards. Spring pruning should not impact on flowering, but a hard summer prune is likely to reduce the amount of blooms produced in the following winter. Simple re-shaping to a desired form can be achieved by using shears to lightly trim off outer leaves and branch tips in late summer. Mahonia bushes will not respond well to clipping to a low mound, as their natural growth pattern is to a tall, rather columnar shape, so allow them to get close to their final height before clipping too radically. Some of the taller types can sometimes become a little bare around the base while continuing to grow long, new branches further up the shrub. In this case, judicious pruning can help to restore the more even, bushy form. If the shrub is becoming hollow, with little foliage in the centre but still very leafy around the outside, then prune out a few branches totally to let more light into the centre of the bush and reduce some others back to around 20cm to 30cm in length to encourage more leaf growth in the centre. 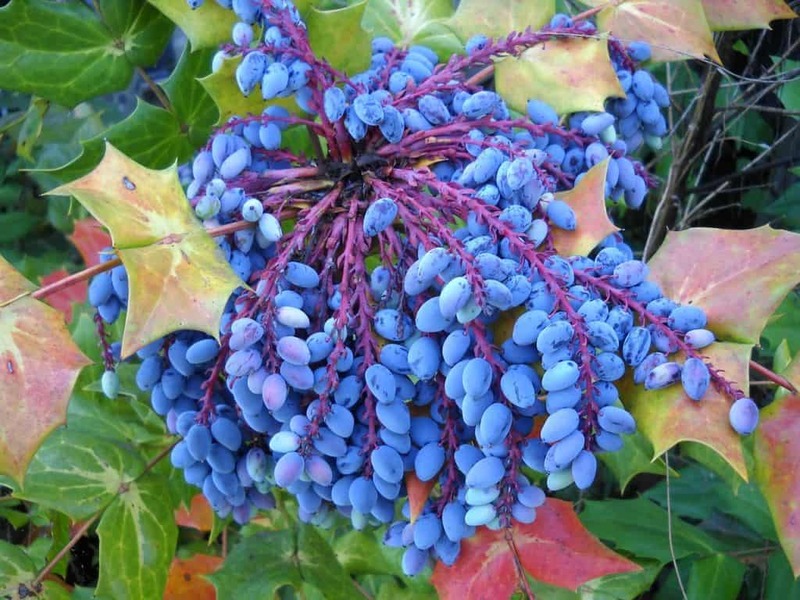 There are numerous ways to create new plants from a Mahonia. To produce genetically identical plants to the parent, it is necessary to take cuttings, either as semi-hardwood or tip cuttings, or leaf bud cuttings. It is possible to collect and grow new plants from seed, but due to cross-pollination, the offspring may not inherit all of the parent plant’s characteristics. The most traditional propagation method is by semi-hardwood or tip cuttings. Fill a 10cm or larger pot with an equal mix of a good quality John Innes cutting compost and sharp sand, and water it well. Take 75cm to 100cm semi-hardwood cuttings from the parent shrub as its new season’s growth starts to harden off. Cut them around 5mm beneath a leaf node. Strip the leaves from the lower half of each cutting, dampen them, and then dip into hormone rooting powder. The cuttings can then be placed into the surface of the compost at 7.5cm centres. Water the pot well and allow it to drain. The pot should ideally be kept in a propagator to maintain moisture, but a plastic bag supported on wires or sticks inserted into the compost will serve just as well. Keep the pot in an unheated greenhouse, cold frame or a sheltered position in the garden, in bright light but not full sun, and the cuttings should root within a few weeks. Keep them well watered until they are ready to plant out in the autumn. Leaf bud cuttings comprise a small piece of a stem that has a single leaf and a dormant bud in the leaf axle. A decent length of stem can be divided up into a number of leaf bud cuttings. Use hormone rooting powder, and insert each cutting into a compost and sharp sand mix with the bud just below the surface. Five or six can be inserted around the edge of a 100cm pot. They should be covered and kept in a sheltered, bright location out of the full sun, and treated in the same way as the semi-hardwood cuttings. Growing Mahonia from berries is a bit more of a chore, though can be rewarding. The ripe berries should be gathered in winter or early spring. These need to be converted to a paste through spending a brief period in the kitchen blender, or by mashing in a dish with a wooden spoon. Add enough water to make a sloppy paste. Drain the paste through a sieve and put the solid content from the sieve onto paper towels to dry. Carefully extract the seeds, and dry them on further paper towels in a cool, dark place. Once dry, store them in a paper bag or similar container in a cool, dark, dry place until ready for sowing. The seed will generally germinate well if sown 5mm deep into the ground or into pots of seed compost in late summer and kept in the garden in a sheltered position. If the seed is stored overwinter to be sown the following spring it will need stratification before sowing. Dampen the inside of the container, re-seal, and keep it in the fridge for 30 days. Add additional moisture and re-seal, and keep in a warm place such as an airing cupboard for a further month. It can then be planted as above, or it can be put back in the fridge for storage until a more convenient sowing time. Mahonia have few pests, and while aphids, scale insects and whiteflies may be seen, they seldom cause a serious problem. However, they are prone to fungal diseases such as rusts and powdery mildew, Mahonia aquifolium especially so. Rust causes reddish-black spots on the leaves that often turn yellow around the edges. The undersides of the affected leaves will have brown, rust-coloured powdery marks. It can be treated which a proprietary garden fungicide or organic alternative, while pruning to enhance air circulation around and through the shrub and the regular removal and disposal of fallen leaves will help to keep the rust at bay in future years. Powdery mildew causes brown marks or patterns and a build-up of a white powder on the upper surface of the leaves, and the grey fungal hyphae can often be detected on the underside. The mildew initially takes hold on the leaves on lower branches, but can then spread higher up the plant. This is also treatable with a garden fungicide and the likelihood of further outbreaks reduced by increasing air circulation and good plant hygiene. If the plant is not doing well generally, a mulch of organic matter and a light dressing of bone meal or blood, fish and bone may boost its ability to resist or survive fungal attacks. Q Are Mahonia berries edible? The berries are edible and rich in vitamin C, but while they may look like black grapes, they are very sour when eaten fresh from the plant. However, they are high in acid and pectin, and can be cooked in a steam juicer to make a very tasty dark blue jam, jelly and other preserves with a spicy, tart and rather earthy flavour. You will need about one and a half kilogrammes of berries to make just three standard jam-jars of preserve. The berries contain a compound that can induce vomiting and lethargy when consumed in large quantities, so any fresh consumption should be limited. Q I am looking for some winter colour and I intend to plant a group of Mahonia shrubs. Where would be the best place in the garden for this? Mahonias do best with space around them, in shaded, woodland-edge type locations. Planting a group will be fine, but ensure they are not crowded and will not grow into each other or surrounding shrubs. Check their likely eventual spread before deciding on planting distances, and it may be better to go for a line than a clump unless you have a lot of depth to plant up. They do well in the back of borders or under the edge of garden tree canopies, where they do not get full sun, certainly not in the middle of the day. If you have a spot where they will get these conditions and where you can plant a perennial border in front of them, the Mahonias will take over the role of providing colour, texture and interest to the border through the winter when the perennials have been cut back. Q One of my cousins in the US tells me that Mahonia is considered a very useful medicinal plant in Oregon. Is this reliable information as I have some in the garden that I could use? The roots and rhizome have been used in various countries to produce ingredients for medications. These have traditionally included lotions and tinctures that are applied to the skin to treat conditions such as acne, allergic rashes, itching and psoriasis, as it is believed to have disinfectant, antibacterial, antifungal and anti-inflammatory qualities and an ability to slow the overproduction of skin cells that contributes to psoriasis. Mahonia also has been used in preparations to treat stomach ulcers, reflux and other stomach and intestinal conditions. In herbal medicine it is available as a tincture, powder, oil and in capsules, and is sometimes promoted as an aid to healthy liver function and to treat gastrointestinal infections and diarrhoea. 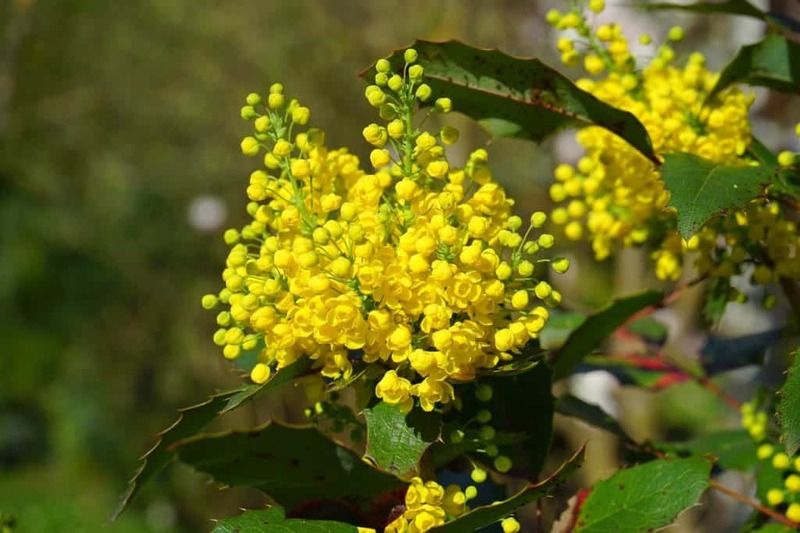 Rubbing the herbal powder made from Mahonia into the gums is also said to relieve toothache, swollen gums and mouth infections.